The Masonry Institute of St. Louis provides on-going technical seminars for local designers, contractors and code officials. Seminars are held both at the St. Louis Masonry Center and in-house at attendee locations. 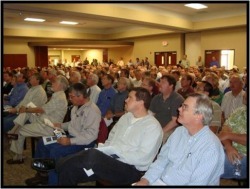 Seminars cover all aspects of masonry design and construction. For more information see our Seminar Series page. The staff at the Masonry Institute of St. Louis is available for consultation with local designers, contractors and code officials on individual masonry design and construction projects. Consultation is availabe in person, by phone, by email, or by fax. See out Contact Us page for contact information. "One-stop" source for masonry design information. Sponsored by the Mason Contractors Association of America. Strategic alliance between the International Union of Bricklayers and their contractors, promoting quality masonry construction. by the Midwest Products Group.